I think there’s been something about blue Monday? Apparently this so-called blue day was Monday, January 21st. Some psychologist invented the term after coming up with a formula for the most depressing day of the year when people feel depressed and at their lowest ebb. Really? Look, life is tough enough for I’d say a huge number of people, and not just the UK which has/is …… just go to my Twitter feed to find out what I think of current affairs. But setting that aside, this ‘day’ is a nonsense. Also I don’t get depressed (anxiety, me) but I had a mother who truly had the illness depression so I think it’s rather a misuse of the terms ‘depressing’ and ‘depressed’. This is a non-thing concocted by who knows for what purpose – just stop! Actually I had a lovely day on that so-called blue Monday. 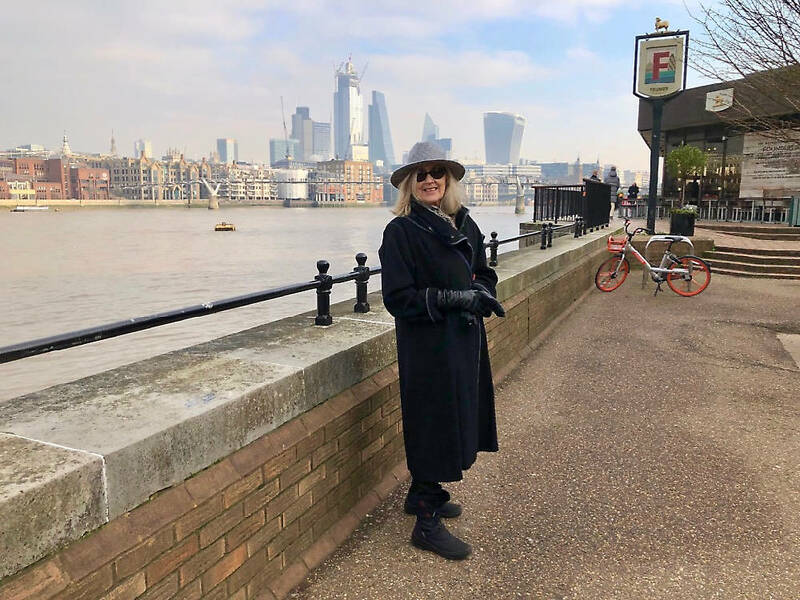 It was cold (for the UK) and around 1C (33F) when we left the house, but we walked to the station, because, yes, this was our first trip of the year to London. I was well wrapped up though. Then a faux fur scarf, which I’d bought last year from a charity shop for, I think, £9.99. It’s rather lovely but needs a cold day to be worn, which it was. I also wore old furry boots (bought new, but they didn’t cost much), my old Peacock’s slim-line black jeans, and the jacket, which you can just see, which came from a lovely junk shop in a French village a couple of years ago, and cost all of 5 Euros. Then the coat. This is a warm and beautifully cut charity shop coat bought last year for £25, which is more than I usually pay but worth it, I think. From Brighton the train took us to Blackfriars and there was a short walk by the Thames – just look at that skyline! And it was one of those glorious, blue sky, crisp, cold days – not depressing at all. Life is too short to think of being blue, although on Saturday, which was grey and rather grimly damp in Brighton, yes, it was a bit hard to be positive. However, I really do mean that, that life is too short to be thinking negatively and especially because of a social media meme – I hope we all aim to seize that carp! Which I don’t always achieve but one can but try! I’ll shut up now! And where were we going? You must know me by now! 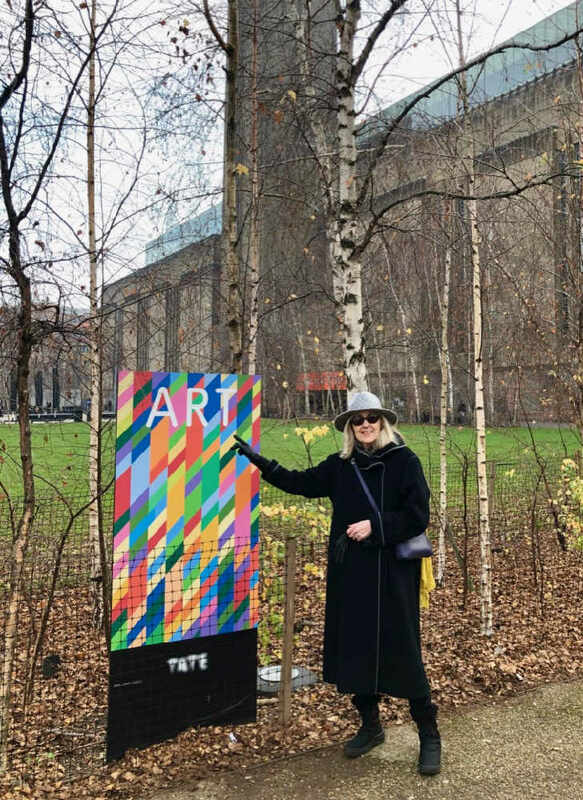 Yes, it was to the Tate Modern to see the exhibition of Anni Albers’ work. She was a weaver, but to say that and to show you a couple of pics cannot do justice to her mastery of her loom, and her ideas, designs and skill with that loom. Btw, it’s on only until 27 January – do go, if you can! It was just wonderful to see what she did. I’ve got very little idea how you work a loom and still don’t, tbh, but a short film in the last room showed some of the complexity of the art of weaving. But Albers did more than just weave, she designed wall hangings and room dividers, decor and important works of art. This one below was commissioned by the Jewish Museum, New York to create a memorial to the six million Jews who had been killed in the Holocaust. The six panels represent these six million. It’s a very powerful piece. I thought the whole exhibition was exquisite and felt quite emotional at times. 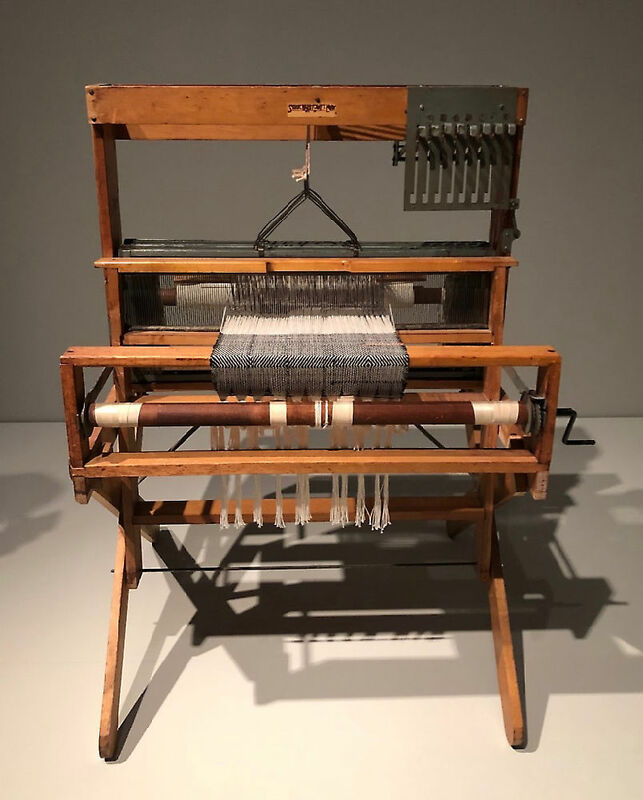 My great-great-grandfather William Hislop was a Scottish cotton hand-loom weaver (as was his father and probably even further back, albeit those ancestors are un-researched at the moment) in the days when the loom was in the home and the whole family participated in the industry of producing cloth. At one time, when the industry was young, cotton hand-loom weavers were the aristocrats of working men and women, but in the time of this ancestor, life were much harder as cotton was beginning to be produced in factories. His two sons, John and Archibald, didn’t continue as weavers but left Scotland, joined a British regiment with their descendants (me included) now as English as they come. 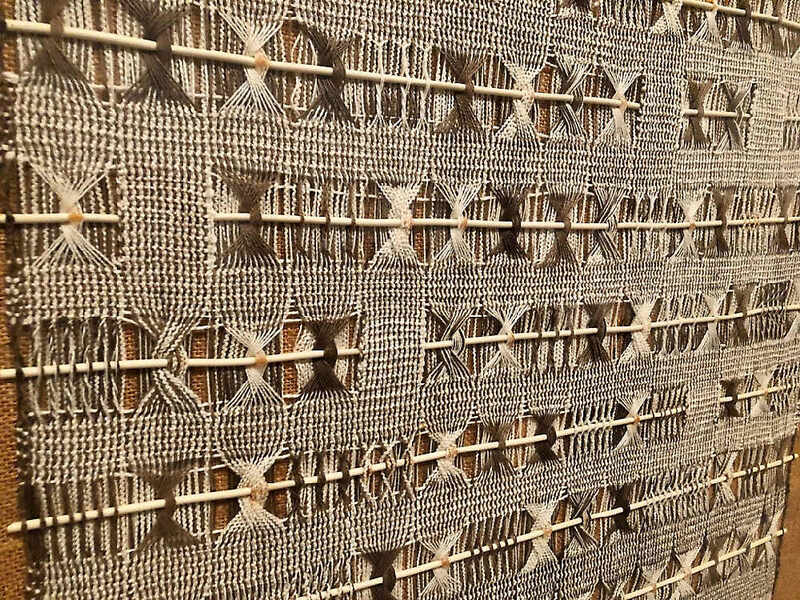 But I went around the exhibition thinking of my Scottish weaver ancestors and how skilled they must have been. 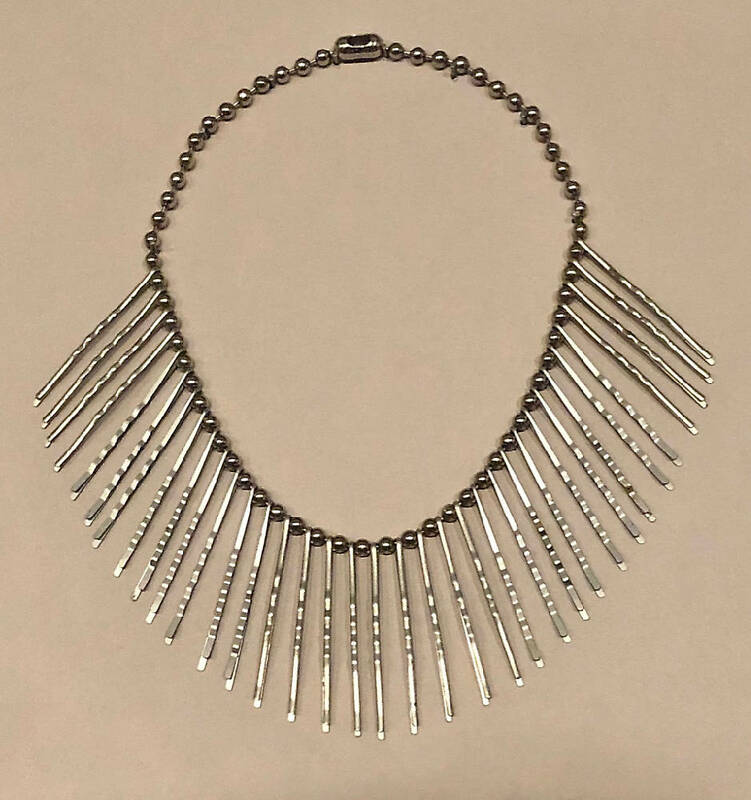 Albers didn’t just do cloth, she also made some amazing jewellery from utilitarian objects like pins and paper clips. I bought a kit to make something similar to this and will show you one day! We used our day well and went round some other exhibitions but by mid-afternoon felt quite weary, so finished with a cup of English breakfast tea and a lovely orange polenta cake. I don’t take pics of food but here instead is another view of London taken from the viewing platform high up in the Blavatnik building. The day continued to be cold, but was the kind of cold which I love! Love the coat, love your ancestoral history and love the exhibition! And yes, that special crisp British chill is wonderful, isn’t it? Regarding your YouTube tips, I know I’ve mentioned before that while I use skin care products, I don’t wear actual make up, apart from lipstick (always) and eye shadow (occasionally). Why? Purely because I never could choose the right shades and felt I always ended up looking more clownish than classic! So I gave up that time-waster years ago and found less frustrating things to do. I wonder, is it just clueless me, or is it the ‘wrong’ and strong store lighting? Either way, I’m off to see what little nuggets of beauty wisdom you impart on your latest ‘fillum’ and see what I can learn to maybe make me change ny ways. I would love to go to New York again for the MOMA and much more – have spent precisely half a day there! I’d like to go to Stockholm again as well. 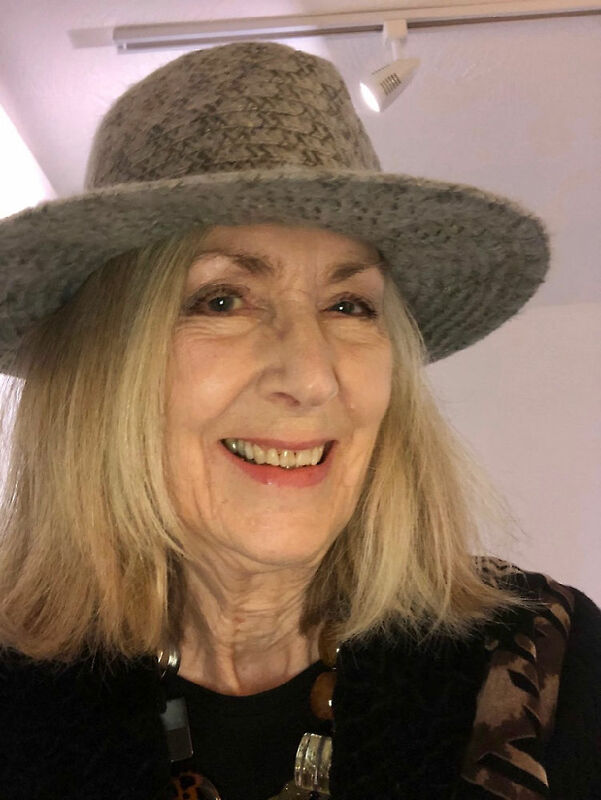 You look lovely Penny…..that scarf is gorgeous…brilliant photos and totally agree about a beautiful COLD day…it is Winter after all!! Thank you for your comment Debbie which is much appreciated! I absolutely love reading your blogs and this was brilliant. I SO agree with you about blue Monday: what a load of rubbish. My favourite type of day and what a great exhibition. Fascinating abd moving too. I believe my ancestors were Scottish and there very well could have been a hand-loomer among them. A few years ago I got quite obsessed with family history but it can take over your life and have pretty much stopped now. But I unearthed a lot of evidence looking at census material – fascinating. Lovely to see a bit of London. We want to visit to one day, but I don’t think it’s very handy with a wheelchair. Legally nowadays, everything should be accessible but whether it truly is, is another matter, and parking the car to get you immediately outside where you want to go would difficult. There are accessible taxis I think. 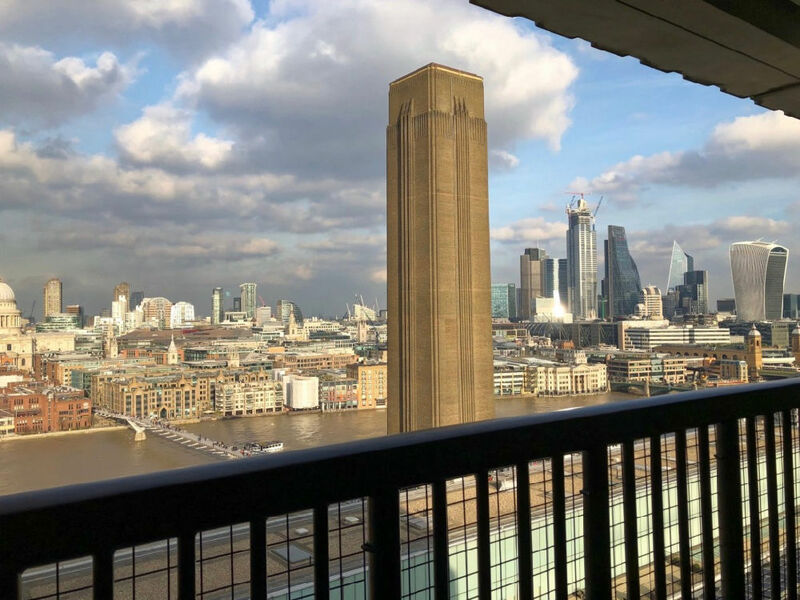 But the big museums are OK, well actually I don’t really know, but on balance I’d say the Tate Modern is good for wheelchairs with wide entrances into the Tate, plenty of lifts, big entrances to the exhibitions and space in the cafes. Very interesting blog as usual, thanks. I think the 21st Jan thing maybe because it is a long month and this is where the time when there is more month than money left! I don’t like January and have just been on a short course at Denman College (WI). You can go without being a member though it costs a bit more. They do a wide range of courses, not just cooking and craft. I did ‘You the Jury’ where the tutor gave us three real murder cases to ‘try’, giving a group verdict at the end. We were then told what really happened, the verdict and sentences and information only available after the event. Fascinating! On the way I met an old friend in Oxford and we had a look around the Ashmolean museum. Today is a cold but beautifully sunny day so I’m happy but I don’t like the grey/wet days. It’s really important to get outside even on darker days as you get more ‘lumens’ even then than in a brightly lit room. The days are getting longer each week and we have our first daffodils out to join the snowdrops which is great to see. Hold on, spring and summer are(slowly) acommin’ in! Yes, I always say I prefer cold weather and I do but the grey days are challenging! However, buying a bunch of daffs and seeing them growing in gardens is such a joy – Spring is round the corner! What an interesting course you went on. I’ve heard of Denman College, from several sources, and must go one day – will go to the website and look right now! Wow, yes that’s better – find some jazz on that day and sing and dance! What a great idea! College thinking the WI meant Wisconsin! What a great course though, I’d have enjoyed taking it myself. Here is a link to more about the Albers exhibit. Those must have been hairgrips/hairclips on the necklace you showed! Very clever. I am going to watch the Youtube now, enjoying them a lot. 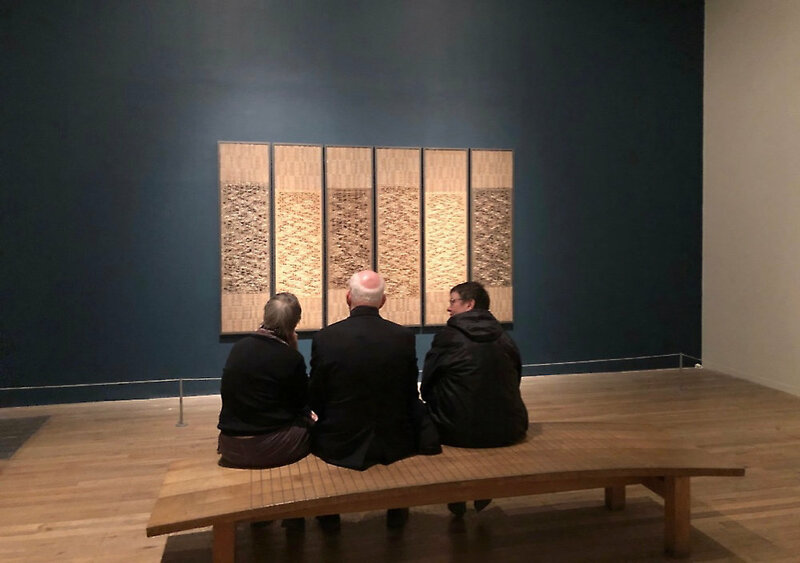 It was a great exhibition and thanks for the link – amazing that two bloggers were writing about Anni Albers around the same time! Ah yes, the WI (Women’s Institute). I don’t belong but it has a huge membership – the college has a good reputation and runs excellent courses. Thanks for watching the videos! Much appreciated! We don’t, as far as I know, ‘celebrate’ blue Monday here in western Canada, but I do recall as a young woman learning there are 2 days of the year which see the most suicides. Hospitals prepared for those days…this may be how the day was chosen…the let down after the effort of Christmas which comes to mean less and less given the commercialism rampant before Christmas, then the reality of the debt…or financial sacrifices made…and perhaps the realization that you truly cannot buy love, and it has become a bit silly to keep up the habit among a large group of adults. Anyway, it may be a day to check on those who do suffer depression. Yes, as to the blue Monday, I didn’t emphasise sufficiently I think that awareness of people with depression should be ongoing, and not about one day. That ‘day’ has been manufactured and I didn’t see anything about selling holidays myself but I had heard that this was what the day was all about. And that’s all wrong. I had a great day on Monday as did my mum. So it is all bunkum! Love your furry scarf and coat. I am a sucker for faux fur. I had a faux fur tippet – you’ve reminded me – but not sure where it is. May have to send the hubster into the loft.Thanks for joining #WowOnWednesday! I wonder if it’s called blue Monday because when you’re working January is a miserable month – I was always looking for a new job after Christmas! Now I find January quite exciting, I woke this morning to our beautiful garden birds singing, I know we have a way to go but spring is surely on the way and we didn’t need to light the lamps until 4.30 today.. Freezing cold here in North Yorkshire but our lovely puppy is delighted to be outside in the frost and after 2 years without a dog I’m outside much more often. I loved your outfit, I wish I could find a similar coat. I always have cold knees! Tbh January is a bit miz especially if it’s grey, what a difference it makes if the sun shines. And yes, I think having one very long coat is essential. I get exasperated by those puffer coats that purport to be warm but barely cover your backside. I want my legs to be covered in the cold weather!!! Sounds like a lovely day out, Penny! I have a day in London planned for my brother’s birthday but it will be too late for this exhibition sadly. 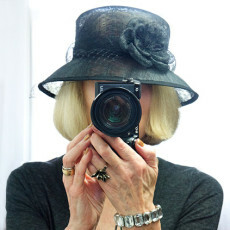 I loved your coat, hat and faux fur scarf; you looked as snug as a bug in a rug – but stylish too! ‘Blue Monday’ what a lot of twaddle!! I’m enjoying the videos; keep up the good work. I too have missed an exhibition that I wanted to see. I fall into not going to London quite easily!!! The fares come into it – for us the line to London Bridge is the best and the cheapest. That coat was such a good find and, as I said in the above comment, I can’t be doing with these short puffer coats, I want my legs covered up in the cold weather! Thank you so much for watching the videos – there’s so much to learn but it’s a great challenge! It may be corny, but I believe life is what you make it and I try to make it as good as I can. I get 90% of my clothes from Thrift shops. I was a single parent for 20 yrs, so that’s when I started going to them. My financial situation changed (for the better) when I got married, but I still don’t see any reason on spending alot of money for clothes, when I can find good quality on pre-loved clothing. I love the long fur coat, it’s lovely on you. I think it’s so important to buy 2nd-hand. We are recycling clothes and saving them from landfill. So important. And as we both know there are good quality clothes to be found. Thanks so much for commenting! Blue Monday! What will they think of next!? As long as one is wrapped up I enjoy cold sunny days better than dull dank grey days.On those days I tend to do my baking.As you say life is too short one has to enjoy every day. Yes, absolutely life is for living and enjoying! That necklace is so fun and cool! It’s so amazing what you always dig up. You have a great eye for recognizing/detecting/finding great/cool things. It makes me love to come back again and again to you blog. It’s always a great surprise what you came up with! Thanks for sharing you post at my party. Thank you Nicole. The necklace was one of those must-have buys at the Victoria & Albert Museum and therefore, unusually for me not thrifted! Thank you for hosting Nicole! I always enjoy your posts on your visits to London. The exhibition looks marvellous and so interesting especially with your family weaving history. I am a tad envious of your Winter garb , you look marvellous. Our heatwave and bushfires continue, could do with a cool change and rain. On another note I am enjoying your videos . Hope the lip products do the trick, would love to see you with a strong lip colour . I always use a lip liner , then colour my lips with it and then apply lipstick with a brush. On me it doesn,t bleed and lasts for hours. I also exfoliate with a soft toothbrush. It was a really good exhibition. That is such a good tip – the one about the toothbrush – I have to be so vigilant with my lips as they peel constantly, as in all the time. All the best re: that heatwave which is a big one we hear. Your cool white top that you featured in your blog must be good to wear. I love your winter gear, Penny. To me, you always look most artistic with the way that you put your clothes together, and I’ve been thinking of changing the way that I dress, partly due to seeing you in your boots, tights, skirts, etc.